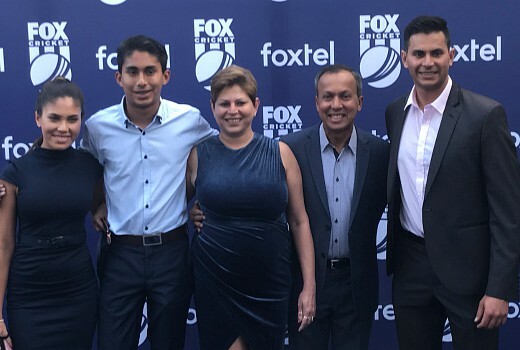 When Foxtel held their FOX Cricket launch this week the guest list included Goggleboxers and Cricket-mad family, the Delpechitras. Eldest son and P.E. teacher Wendel told TV Tonight he was the most fanatical of the clan. “I’ve got to take the credit for that. I love my Cricket, but it’s thanks to Dad,” he said. Dad Patrick was happy to elaborate. “I got the kids into it. I was bit of a player in the 80s, and still going strong!” he explained. “I was a bowler with a leg spin and I taught the skill to the boys as well. But they are good batsmen, too! “So we are a Cricket-loving family. So we love Foxtel having it full-time now. I’ll pass on all my home duties to the missus and I’ll be watching the Cricket!” he joked. “They definitely hog the TV,” added daughter Vestal. The Delpechitras are now in their 8th season of the LifeStyle / TEN show and loving it. “Everyone loves seeing how other people react because it allows everyone to make a connection with other people,” says Wendel. “Sometimes we get fans coming up to us which is nice,” said Patrick. “When we are all together we get recognised the most,” added Vestal. Youngest son Ethan joked, “At school I get teased,” but at just 15 his towering height means he no longer has to sit on the floor. Gogglebox has 3 more episodes to air this season, which will signal time for families to gather in Sydney & Melbourne to toast another year.